We have been excitedly setting up and getting ready for our first year of homeschooling. Although our first day of school isn’t until September, I am pretty much ready to start. We are going on vacation soon and I want everything to be done before we go. I still have a few organizational type things to do, but for the most part we are all set. Here is a peek at where we are planning to have school everyday. This room is in the downstairs of our house, off of our family room. It’s not a huge room, but I think it will work for us. This is what the room looks like from the doorway. The window made it really hard to get a picture of this wall, but this wall has our calendar and calendar board. I have another post coming that shows what we are using on our calendar board. We also have our flag and some maps on that wall. There is a window shelf where I am keeping a few of my supplies. Along the very top of this wall where there the flower boarder is will be where we will display our artwork. I have a post in the works for that, to show how we made it. Then there are shelves that display some of the Lego creations Hailey has done. She loves to put them together and then display them. This wall has magazine holders full of books. The magazine holders are labeled for different types of books (fall, Christmas, winter, Dr. Seuss, Disney, science, etc.) We also have a “USA Animals” board where we will put pictures of the animals we learn about while we do Road Trip USA. Then there are some bins where I will keep my papers organized. There is also a shelf that has some oversized books that wouldn’t fit in the magazine holders and well as some bins. This is Hailey’s desk. We will probably share it, but for the most part this will be Hailey’s workspace. There is also a Word Wall on her desk. 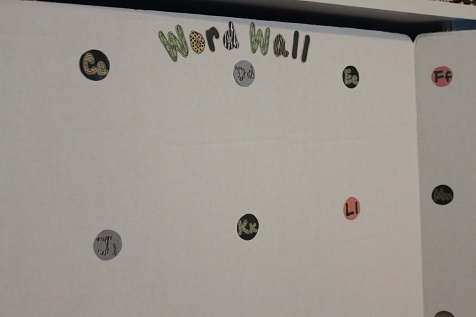 Here is a close up of the Word Wall. Hailey and I looked through Pinterest and she found an animal print that she liked. It’s free on Tpt. Here is the last wall of our classroom. This wall has our white board. Above the white board is our weekly Bible verse and our weekly poem. The little table is Hunter’s workspace. He already loves to sit there and work, so hopefully that will continue when we actually start school. You can also see our Chicka- Chicka- Boom- Boom tree that my mom helped me make a few years ago when Hailey was learning her ABCs. On the far left is Hunter’s ABC wall. Here is a close up of the alphabet I am using for Hunter. When I found these Zoomin Moving ABC Wall Cards over at Royal Baloo I was so excited! Hunter loves anything with wheels so he was really happy to see these when I put them up. We will also spread out into our family room where there are some comfy couches, perfect for snuggling up in with a good book. I’m sure there will be art projects done in the dining room so I have easy access to the kitchen. In other words, we will probably homeshool all over our house, but this room will be our main classroom. I hope you enjoyed the little tour of our homeschool room. Great space! We used our school room for half of the year last year (the last half). We move around and mix it up sometimes. 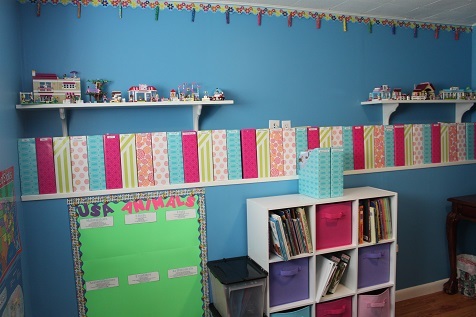 I have a toddler and newborn, so I don’t plan on using our schoolroom much this year. Good luck to you and I hope you have a fabulous year! Love your art clips by the way! Love the shelves to display Legos! Ours tend to get ripped apart soon after : /. Thanks for the peek! Love posts like these! The walls make me VERY happy! 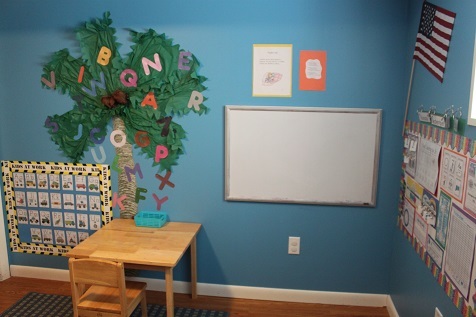 Great homeschool room! Wow, just love your room & all the colors! Well Done! This looks well organized and exciting. The kids are going to have a fun time here I can tell! I am a big fan of reading aloud and would suggest a reading corner.. but other than that it looks perfect! 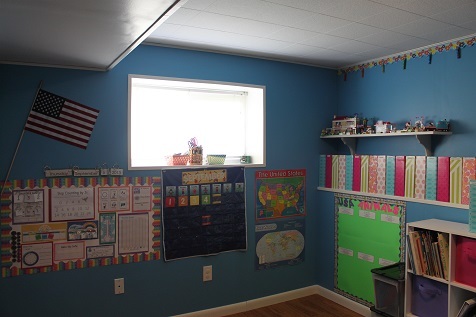 What a nice looking homeschool room! I love that it is bright & cheery! 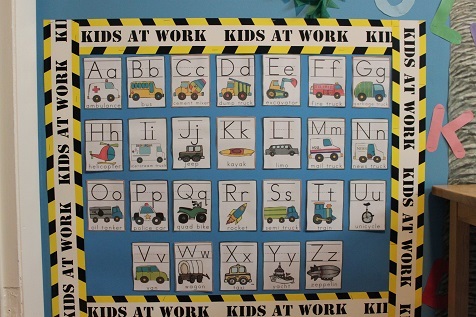 Love those ABC cards- I made a huge display with them in our learning space too! I love the alphabet tree! 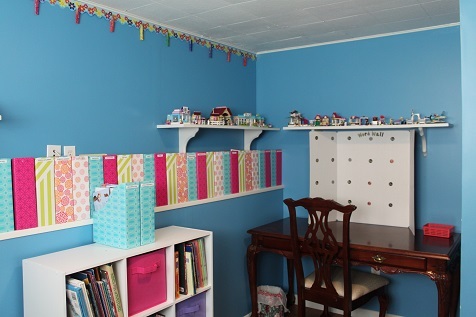 Everything is so organized and beautiful in your homeschool room. That would be a great place to learn! Thanks for sharing at Mom’s Library. Thanks for sharing your pictures. They have given me so many ideas. It has been very inspirational. I can not wait to get started on mine. Where did you get all your book boxes??? Love the colors/designs!